SolarWinds Storage Resource Monitor provides drag-and-drop performance metrics and events from multiple device types to a chart, so you can analyze what was happening in your environment when the issue occurred. With SRM, you can also poll for issues you're experiencing now. You can mix and match metrics from data collected across multiple SolarWinds products, for both broad and detailed views of your infrastructure. SRM also reports and alerts on multiple vendor storage devices, for performance and volume capacity, storage pools, LUNS, and disks. This performance and capacity information is easily available through SRM's intuitive UI and customizable web-console. SolarWinds Storage Resource Monitor reports and alerts on multiple vendor storage devices for performance and volume capacity, storage pools, LUNs, and disks. This performance and capacity information is easily available through SRM's intuitive UI and customizable web console. SRM uses SMI-S, SNMP, and embedded API communication to retrieve information from supported arrays. Arrays need to be configured for use with SRM. How they are monitored varies depending on the manufacturer and array model. In most cases, arrays can be monitored using an external or embedded SMI-S provider or REST API. Some providers are enabled by default, others need to be enabled manually. After an array is configured, it can be added to SRM for monitoring using the Add Storage Device wizard. The Storage Home or Summary page provides the main view of all resources and a high-level overview of all monitored storage objects, including alerts and events. All Storage Objects provides a comprehensive look at all the storage objects in your environment. By default, arrays are grouped by vendor and can be customized as needed. You can expand on any vendor and drill down to an array to access details. Storage Objects by Performance Risk provides a list of all storage objects currently being monitored by SRM, and objects with the poorest performance are shown at the top and are sorted by highest latency. Storage Objects by Capacity Risk displays objects already at full capacity, followed by devices approaching full capacity. Usable Capacity Summary shows expandable fill charts for all arrays and clusters monitored by SRM. These indicate how much of the total usable capacity is currently in use and how much remains. Click on an array or cluster to open the Details page. Array Details displays hardware and software information, including the serial number and firmware version of the array. Array Status summarizes data metrics for the current array cluster using multiple charts. Performance Summary displays stacked performance metric charts. Use the cursor to compare the stacked values for all metrics for a specific polling time. SRM also provides hardware health monitoring, offering immediate insight into hardware issues in your storage environment. Monitoring hardware health on storage arrays gives access to the status and values of onboard sensors, such as fan, power supply, temperature, and disk health information. From the Array Details page, you can click on a storage pool to access the Pool Details page. Here you can see status, capacity, and performance for the selected storage pool, as well as an IOPS Performance Chart that will show you the performance of the storage pool alongside the top LUNs that belong to that pool. 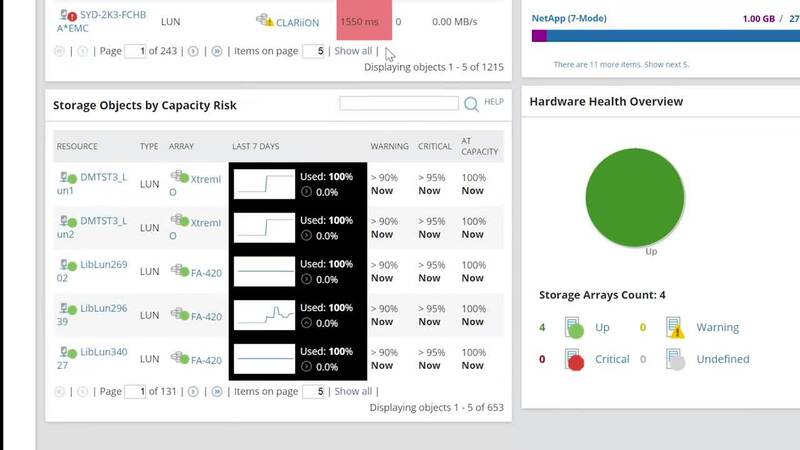 Storage Resource Monitor is one of several SolarWinds products that is part of AppStack. AppStack is a feature that automatically correlates the storage, virtual, and application layers to offer you a contextualized view of your environment. It provides an in-depth perspective to help identify the root cause of performance and availability issues. When SRM is used as a stand-alone product, AppStack displays the status and relationships between arrays, storage pools, NAS volumes, and LUNs. When SRM is integrated with other Orion Platform products, such as Server & Application Monitor and Virtualization Manager, the AppStack view will show relationships to datastores, applications, physical and virtual machines, and their volumes. Clicking Performance Analyzer takes you to the PerfStack Analysis dashboard and will automatically pre-populate relevant metrics. In this case, the pool metrics. This dashboard enables you to correlate historical data from SRM and many other SolarWinds products in a single view. This view makes it easy to troubleshoot issues, create ad-hoc reports, and make data-driven decisions on infrastructure changes. Drag-and-drop performance metrics, events, and log data into a chart to perform deep analysis and troubleshoot issues in your environment. For more information on Storage Resource Monitor, visit SolarWinds.com.